Take a Walking Tour of Clarksdale’s historic district, which is the neighborhood where Tom ‘Tennessee’ Williams spent his childhood. During the annual Tennessee Williams Festival, porch plays are presented in this area with the audience sitting in lawn chairs. St. George’s Episcopal Church and Church Office – 106 Sharkey Avenue (former rectory where Tom Williams lived with his mother, Edwina Dakin Williams, his sister Rose, and his grandparents, Rose Dakin and the Rev. Walter Dakin, rector in Clarksdale for 16 years) while his father, Cornelius Williams, a traveling shoe salesman, was on the road. Featuring miniature flying buttress, the 100-year-old brick structure is an architectural gem with exposed interior beams, gleaming altar brass, and rich stained glass windows including two dedicated to Reverend and Mrs. Dakin and large signature windows: the Good Shepherd and St. George behind the altar. The church hosts an organ recital and open house in the former rectory at each festival. In 2008 Clarksdale dedicated a “Walk of Fame” bronze sidewalk plaque honoring Tennessee Williams outside the church office. The former rectory is also a National Literary Landmark. The Cutrer Mansion – 109 Clark Street – The Italian Renaissance residence built in 1916 by Blanche Clark Cutrer (only daughter of Clarksdale founder John Clark) and her attorney husband John Wesley Cutrer, anchors Clarksdale’s historic district and hosts an open house during the festival. The showplace residence where the era’s cotton-wealthy “jet-setters” lived with Italian gardeners, French chefs and entertained lavishly with masked balls and house parties, was a site visited frequently by young Tom Williams with his grandfather on parish calls. It is considered to be Tennessee’s “Belle Reve” – the lost ancestral home of Blanche and Stella in A Streetcar Named Desire. Today the structure is the centerpiece of the Coahoma Higher Education Center, an artistic and educational conference center for classes and cultural events for Coahoma Community College and Delta State University. After heading the list of Mississippi’s 10 Most Endangered Historic Buildings, the Cutrer Mansion was renovated extensively. The Clark House – Next door to the Cutrer Mansion, the magnificent mansion was built in 1859 by Clarksdale founder John Clark, and today has been renovated into a residence inn by California developer Charles Evans. It has hosted receptions and porch plays during the Williams Festival. The Barr-Brewer Mansion – 91 John Street – A short walk from the Cutrer Mansion is the palatial residence of former Mississippi Governor Earl Brewer and home today of Tami and Dr. Mike Barr. Its fabled reception rooms have hosted numerous receptions during the festival, and its magnificent columns define a stage for porch plays. 235 Clark Street – The double-galleried home of Fran and Tom Ross, across the street from the Barr/Brewer Mansion, hosted the unveiling of the U.S. postage stamp honoring Tennessee Williams in 1995. Four generations of the Ross family have lived in the historic turn-of-the-century residence. 203 Court Street – The Victorian-style law office of attorney John Sherman on the corner of Court and Yazoo, faces the Coahoma County Courthouse and serves as a stage each year for student drama class theatrical presentations including performances by Clarksdale and Hernando High Schools. The Tennessee Williams Park – Located at the foot of Court Street, the park was developed by Clarksdale’s Board of Mayor and Commissioners and features an angel statue reminiscent of the signature set piece from Summer and Smoke, a period play set in Clarksdale. The statue was a gift from the late Mary Jo McIntosh in memory of her husband, Bob McIntosh. The playwright’s brother, Dakin Williams, often gave poetry readings in the park. It also has been used for plays and the presentation of student acting trophies. The area was once a playground for Tom Williams and his friends, Eddie Peacock, Phil and Charles Clark. 501 First Street – The law office of Chapman, Lewis, and Swan facing First Street was the former Peacock residence – home of Tom’s friend Eddie Peacock and his sister, “Baby Doll” Peacock – a name he borrowed for 27 Wagons Full of Cotton and the movie, Baby Doll, starring Carroll Baker that was filmed in Benoit, Miss. CLARKSDALE – Each year, during the second weekend of October, the internationally-acclaimed Mississippi Delta Tennessee Williams Festival features porch plays and live drama starring Broadway stars, regional professionals and fledgling student actors, a literary conference with America’s top scholars, music, receptions and Southern cuisine in the childhood neighborhood of Brick, Blanche, and Baby Doll, the festival is a hometown celebration that has attracted critical acclaim. Awarded the Mississippi Humanities Council’s prestigious Partner Award for excellence and community collaborations in February 2009, the festival was recorded for a BBC documentary titled, “Cat on a Hot Tin Roof,” that aired in September 2009 for an audience of 13 million listeners in the UK. Although Tennessee Willilams died in 1983, the popularity of his works continues globally and especially in the UK, according to BBC producer Carmel Lonergan speaking at the October 2009 Clarksdale festival. Opening in January in London’s Novello Theatre is the celebrated Broadway production of “Cat” starring James Earl Jones, a native Mississippian, and Phylicia Rashad with programs expected to publicize Clarksdale’s 2010 festival. In the early 1990s, French actors came to soak up Southern lore and guitar instruction before their production of “Orpheus Descending,” and an International Tennessee Williams Conference at the University of Nantes. Traveling from London this summer before her role as Stella in the West End production of “A Streetcar Named Desire,” Golden Globe nominee Ruth Wilson, called her visit “invaluable” for her performance with Oscar winner Rachel Weisz as Blanche DuBois. So did British actress Frances O’Conner who learned how “to speak Southern” several years ago in Coahoma County plantation homes before she earned standing ovations as Maggie. “This visit to Clarksdale has been invaluable; for me as an actor it is very important to fill my body and mind with sense memories,” says Wilson whose 2008 performance in the Masterpiece Theatre television series,” Jane Eyre,” earned her four Best Actress nominations. Among the sites she viewed were St. George’s Episcopal Church and former rectory, the Cutrer Mansion and Clarksdale’s historic district where he spent his childhood, the Stovall and Anderson plantations, Uncle Henry’s Place on Moon Lake, and miles of green Mississippi River levees, farmland, and cypress brakes. “So on stage when I talk about Belle Reve (Clarksdale’s Cutrer Mansion is generally regarded as the ancestral home of Stella and Blanche in ‘Streetcar,’) or Moon Lake, I have an immediate and natural reaction to those places, those people,” she continues. “It is a way for me to immerse myself in the world of the play; I can literally hear, smell, feel, and see those places, those people,” she says. Miss Grimes appeared in Vanessa Redgrave’s New York production of the Tennessee’s “Orpheus Descending,” and has forged solid friendships with Clarksdale residents. Other festival regulars include Oxford actor Johnny McPhail, star of Sundance Film Festival winner, “Ballast,” and theatre veteran Erma Duricko, founder of Blues Roses Productions, who directs the Student Drama Competition. In 2010 the African-American production of “Cat” in London will share connections with Clarksdale’s Williams Festival, since it is produced by one of America’s Historic Black Colleges and Universities (HBCU). Hundreds of African-American students have competed annually in the festival’s Student Acting Competition that awards $3,000 in cash prizes for winners in monologues and scenes. In 1995 Clarksdale’s festival was selected by the U.S. 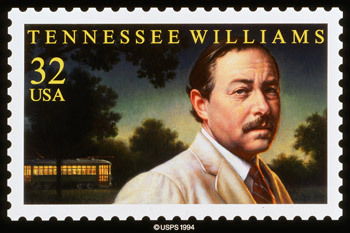 Postal Service to host the unveiling of the Tennessee Williams postage stamp and also the authorized biography of the playwright by writer Lyle Leverich. In November Vicksburg’s retired chancery clerk requested a special tour of Williams sites for “Twin Peaks” television series star Catherine Coulson in preparation for her role as Big Mama in the “Cat on a Hot Tin Roof,” production at Oregon’s Shakespeare Festival in January. Clarksdale’s festival organizers coordinate activities each spring with the Delta Literary Tour sponsored by the University of Mississippi’s Center for the Study of Southern Culture, and are part of the Southern Literary Trail through Georgia, Alabama, and Mississippi. Hosted by CCC with additional funding from the Mississippi Arts Commission, the Mississippi Humanities Council, the Rock River Foundation, local businesses and donors, the festival is free and open to the public.